When words or thoughts are translated from one language and a particular culture to another the meaning changes. These changes often go unnoticed and individuals apply a current definition to the words. In fact the meaning of words is in people. This could be the reason English/European students read authors rather than subjects. Knowing the orientation of the author and the background, philosophy, and purpose of the composition increases the understanding of the written document. So rooted in the earliest awareness of a need for knowledge and the continuing search by generations of thinkers, the systematic process of investigation emerged. 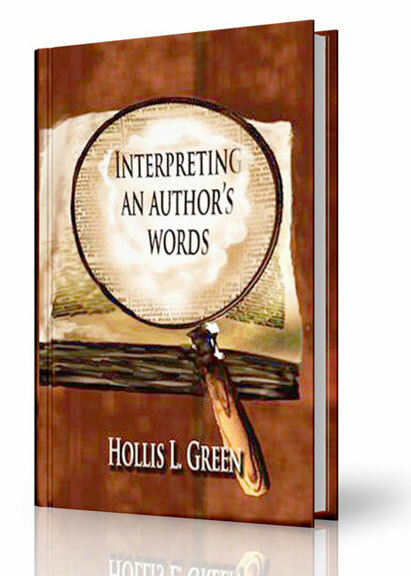 Interpreting an Author?s Words is a proper beginning to higher education, whether that education is college, graduate school or the never ending world of self-education. The basic premise of Dr. Green?s book is simple: To rightly understand the words we are reading, we must better know the author and the author?s viewpoint. Merely reading the words may mean we have missed what the writer purposes for those words because we lack this foundational information. In my many years of graduate studies, I do not recall this being as clearly enumerated or explained as I found in Dr. Green?s small, but important work. He leads us through a clearly outlined process on how to understand the written word of others. Then Dr. Green takes us to the next step and teaches us how to better explain ourselves in our own writing, reminding us that ?Composition is a substitute for personal contact.? I have been a professional writer for over thirty years and have led seminars and workshops on writing for publication for over two decades. His suggestions on how to write clearly and cleanly are among the best I?ve seen. I will be putting this book on the required reading list for my students and will be using it as a foundational document.
? Dr. Michael Sanders, President Saintwinter Press?